Friday evening, July 4th Holiday weekend. Muggy day, people leaving for the Fourth of July weekend, loaded with bags. A crowded train, a weekend getaway, whatever shall we do to pass the time? I know, lets paint my nails! Ahhh, sweet, sweet acetone! Has ever a more delightful fragrance wafted across a crowded train? 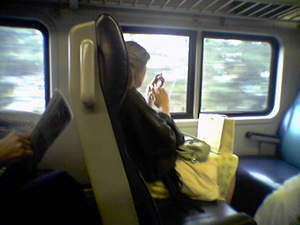 Another selfish jerk on the LIRR . . .